Protesters outside the "Deploraball" have been hit with pepper spray grenades ahead of the inauguration of President-elect Donald Trump. RT America is on the scene in Washington, DC. Police fired some sort of tear gas at demonstrators, according to RT's Alexander Rubinstein. The protesters are throwing things at officers, including posters, water balloons and even a bike at one point. "There are explosions," Rubinstein said. 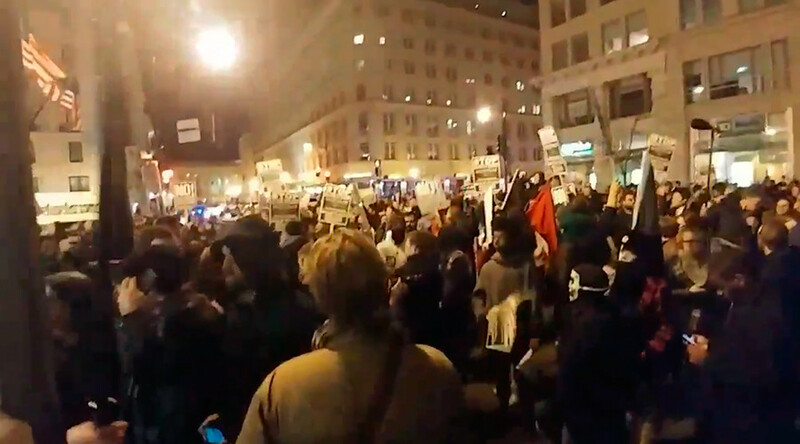 Some people leaving the Deploraball, the pre-inaugural party to celebrate Trump's election, were targeted by protesters, who threw projectiles. A protester was also seen lighting a fire in the street. Another fire was seen smoldering in a trash can. Plants along the street were also ripped out and thrown. A Deploraball attendee was beaten by protesters as shouts of "Bleed Nazi, bleed!" rang out. The man escaped through a line of police, who then sprayed pepper spray into the crowd. Police sprayed protesters with an unconfirmed substance, possibly pepper spray or mace, at a high pressure. The Deploraball is a pre-inaugural party to celebrate Trump's election. About a thousand so-called "deplorables" are expected to attend the event at the National Press Club. The name is in reference to Democratic nominee Hillary Clinton's remark that "you could put half of Trump's supporters into what I call the basket of deplorables."